Can you help ID this curtain fabric? Thread: Can you help ID this curtain fabric? 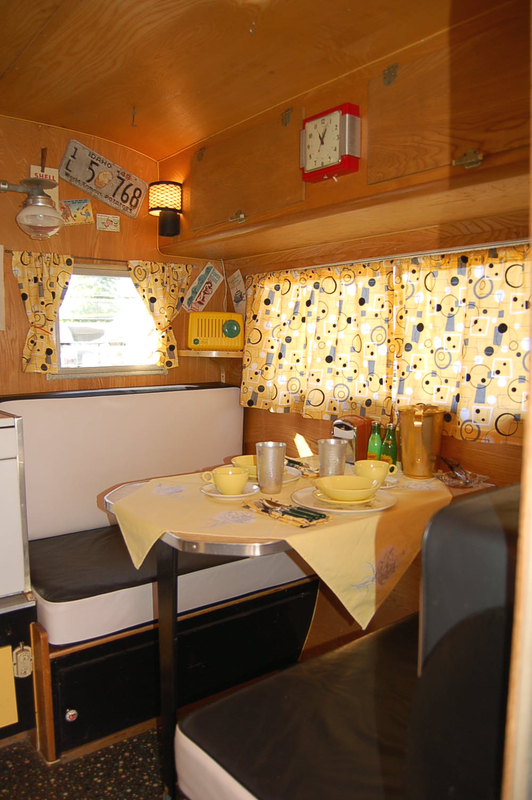 Can anyone identify the fabric used to make the curtains in this vintage trailer? How pretty! I've seen some similar fabrics when I've googled "retro fabrics" under the images tab, but don't know if I've seen this exact one. I can't help you, but I really like your set-up. So neat and perfect. Makes me smile. Very nice trailer. I don't know a thing about that curtain material. If you go to etsy and type in yellow and grey geometric retro you will see several items made from that material. Maybe you can email one of the sellers and they can tell you what line it is from. The one listing says it's poly/cotton so it may not be a quilting brand. The other two say it's cotton but I'd be more willing to believe that the poly/cotton claim is more accurate. It's easy to assume something is cotton. I'm wondering if it isn't a vintage barkcloth fabric, which often had these retro geometric prints. That would seem appropriate for this trailer. I love the feel of barkcloth; it's cotton and easily washable. Last edited by Jan in VA; 07-01-2013 at 10:47 AM. Couldn't get it to zoom close enough to really see, but I'm guessing it is made from Bark cloth, too.